It’s been said that children no longer know how to cook, and that the fact they are not taught in schools any more – and that their parents seem to be too busy to show them this valuable life skill, contributes to obesity levels and general poor diet. There have been campaigns from some high profile celebrities, including TV Chefs Nick Nairn and Jamie Oliver, to get cooking reintroduced to children at school, and also to encourage parents to teach their offspring from an early age. Learning to cook can be a fun activity for your children, as most kids love to be creative and cooking is just that. You can also teach them valuable life skills, as it’s becoming more apparent that the art of cooking seems to be falling by the wayside in favour of ready meals and junk food. Teaching them to cook from an early age will give them confidence and help them to look after themselves as they grow older. It will even be good for their health, as you can teach the children all about nutrition as they grow older, too. 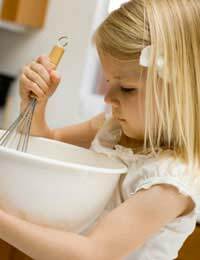 Most children like to be involved, so if you’re in the kitchen, suggest they help you out! There are many creative ways that you can encourage them to enjoy cooking, while teaching them about hygiene, and nutrition at the same time. Ask them to fetch ingredients for you, help you measure them out and mix them, wash fruit and vegetables. As they get older you can ask them to try more difficult things like peeling the vegetables, chopping, and more. Start older children off in good stead with some good, healthy basic recipes that can be adapted to their own tastes. Once you’ve taught them some basic cooking techniques, health and safety, you can talk about other things that come in useful when you’re cooking - . using maths skills when measuring out and adding ingredients, reading and using recipes, organising themselves so that everything is in place before they get started cooking, cleaning up after themselves, shopping, and healthy diets. Once a child can read well enough to follow and understand a recipe, and can be trusted with sharp and hot implements, it’s time to let them loose and make a meal all by themselves! It might seem daunting at first – to both of you – but can be a real bonus because not only will your child learn how to cook, but they will be able to do it for you! Show them the best way to prepare meals, lead by example, and give them lots of supervision at first so that you can keep an eye on them, make sure hands are washed and knives handled correctly. After a while it should be safe to leave them to their own devices in the kitchen, and you might find you have a budding Gordon Ramsey in the making! Teaching older children about healthy cooking can really pay dividends, as the knowledge will encourage them to make healthier choices. Knowing what to do with raw ingredients and how to make a meal from scratch will be important when they grow up and fly the nest, and you will be able to feel confident that when they go off to university they won’t be living on fast food and beans on toast!